1835 . . . Mill is intact, although skylight "Monitor" roof was removed to add a full third story during Bradlee ownership in the 1860s.The cupola was also removed at a later date. This is 4 stories high in the rear, north facade, brick. Outbuildings (Picker House, wheel, engine, boiler house have been removed. Two large wooden structures about 200 ft. north of 1835 mill are intact. The northern most building was later razed. 1844 . . Marland built wooden large mill, on east side of river, first floor basement of granite and brick; upper two stories of wood; pitch gable roof; dormer windows and skylights have since been removed. Wooden parts of the mill now covered with asbestos shingles. Mill and wheel house, also dating from 1842, is intact - as is boiler - engine house and dye - house, 1871. 1848 . . Wool storehouse on Dale St. of un-coursed granite rubble and brick; two-storied; ridge roof; brick dentil work on gable ends. 1889 . . Nearly identical storehouse across street from 1848 structure. Stone foundation; brick wall cover. razed in 2004 for Ballardvale Crossing Condo development. Asa Abbot had saw - mill here in the 1750s. By 1790s Timothy Ballard owned mill privileges which were bought by John Marland, 1835. Here on site of old saw and grist mill, an inventive and ambitious industrialist founded the Ballardvale Woolen Mills, acting as its manager, treasurer and agent. In Feb. 25, 1836, Daniel Poor & Abel Blanchard partnered with John Marland, Abraham Gould and Mark N. Newman formed its corporation The Ballard Vale Company with stock of $64,000. The brick mill was built at this time, 1835. Woolen yarns were made by double spinning, first time this process had been used in North America, used for weaving of white flannels. John Marland also experimented briefly with silk production. In 1842 the company purchased worsted machinery from England and first piece of worsted made in U.S. by power machinery. 1844, Marland built the wooden mill on the east side of the river for manufacture of worsted goods. 1847, built Ballardvale Machine shop, (a stone mill-hauling stone 4 miles through woods) to the west of this complex. 1848, John Marland built locomotives for railroad; made shoes and carriages. . By 1848 there were two large mills, store houses and smaller frame buildings. In 1859, the worsted part of the mill was leased to Marland's brother-in law, Jeremiah Young, who produced flannels until 1866, when the corporation became a private enterprise. Young moved the business of flannels to Lawrence, 1853, where he was first treasurer of Pacific Mills. Thus, the 1844 wooden structure built for manufacture of worsted's was then used for flannels. The 1850 Andover Valuation schedule list the Ballardvale Manufacturing Co. with 1 Brick Mill, 1 Wooden Mill, 1 Brick Finishing Mill, 1 Brick Warehouse, 10 dwelling houses and a Counting room for a $47,700 valuation. In 1855, Whipple File Co. acquired the stone building (former BV Machine Shop) manufactured steel files, first successfully produced by machinery. (later owned by Craighead & Kintz fire destroyed in 1898). John Marland went bankrupt in 1849 and the stockholders took over the Company. Captain Josiah Bradlee, treasurer, took over management, with James Shaw his superintendent. On November 21, 1865 the Ballard Vale Co. Charter was dissolved by petition of J. P. Bradlee. The company assets were assigned to Henry W. Paine,Counselor of Law in Boston. Bradlee now the sole stock holder too control and ownership of the comapny on Feb. 16, 1866. 1866. As sole proprietor the company became J. P. Bradlee Manufacturing Co. Bradlee brought Ballardvale flannels to world fame, employing 200 hands. He was with the mill over 50 years and did much to develop Ballardvale Village; amusement center, concerts, and lending library. The local district school was re-named for him in 1897. Bradlee died on Feb. 2, 1887, leaving over a million dollars in Trust for his family and sister Helen C. Bradlee. Nathaniel J. Bradlee, a Boston architect and close friend to the family and William H. Hodgkins were Trustees. Nathaniel J.died the following year in Dec. 1888. Helen died on June 4, 1896. The Bradlee's home was at 17Ashurton Place, on Beacon Hill, Boston. Jones, William L. Strong and William H. Hodgkins took over mills, followed by Joseph Shaw in the 1890s as Superintendent and Howell F. WIlson Manager. William H. Hodgkins, sole Trustee of Bradlee's estate sold the holdings to the Ballard Vale Mills Co. on Feb. 6, 1905. In 1926 most of the company residential properties were also sold off and then the mill complex followed on Sept. 29, 1927, sold to the Northern Rubber Company - Sept. 29, 1927 . 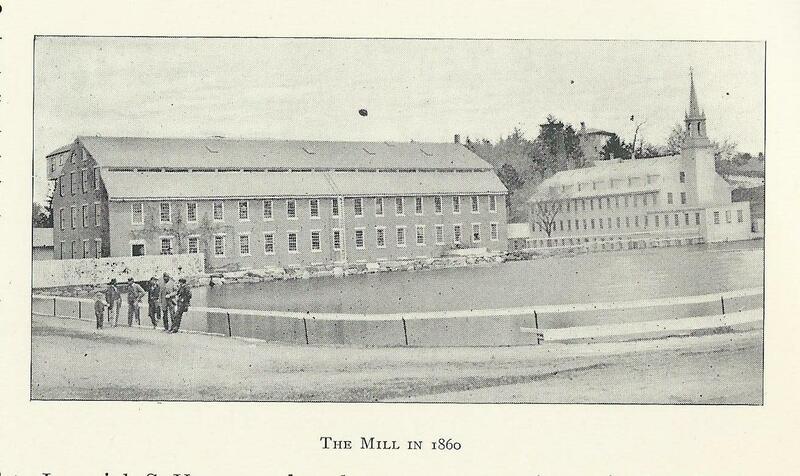 The Ballardvale Mills taken over by Phillip French, who used building as headquarters for Northern Rubber Co. The Mill held the mortgage. The Northern Rubber Co. mortgage was sold to Susan A. Hodgkins, widow of William H. Hodgkins on Apr. 12, 1932. She would foreclose on the loan the following year on Mar. 25, 1933. Northern Rubber Co.went out of business 1950s and buildings tenanted since. First National Bank of Boston took possession of the property on Aug. 17, 1943 and then sold to Wool Warehouse, Inc., Geo. L. Anderson Treas. on May 29, 1944. C. Lincoln Giles purchased the mill complex on Aug. 25, 1961 which included 18.73 acres with buildings. The 1844 wood mill building on the east side of the river was sold to the Shawsheen Rubber Co. in 1951. Lincoln Giles, and architect and developer loved to rehab old properties for small businesses, retail space and residential apartment units. Giles would sub-divided the complex into separate parcels and sold them off individually to new owners. Giles planned 1961 renovations for diversified industry but "retained design of original" buildings. A northeast wing to this building was razed as were other miscellaneous add-ons. Giles leased the building to Emmco Plastics Corp. for seven year on July 26, 1962. Hillery Realty Trust, Robert P. & Janet M. Hillery, Ronald W. Haselton purchased the mill building on July 27, 1962. Applied Microwave Laboratory, Inc. were the next owners on Aug. 26, 1969 which then changed their name to Essco Real Properties, Inc.
G. A. C. Discount Co. of Chelmsford, Inc. - FKA - First Finance Corp.
Essco Real Properties, Inc. FKA - Applied Micro. Lab. Inc.